Sometimes, you just can’t cut corners – and one of those times is when it comes to basic hygiene. First: Sleeping in your contacts. It boosts your risk of developing infections by a whopping 1,000%. And can cause cornea scarring and permanent vision damage. In fact, one ophthalmologist from NYU Medical Center says 95% of the eye infections he treats come from someone sleeping in their contacts. So, take your contacts out and use new solution every time you clean and store them. If you don’t, it’s like taking a bath in yesterday’s dirty bath water. Next: Not flossing. 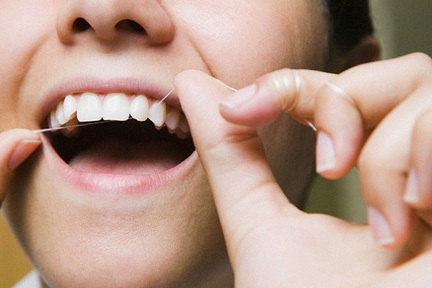 Experts say if you’re not flossing every day – it’s like taking a shower – but only washing your chest and back and forgetting your armpits and privates. You’re not getting 100% clean – and the spots you’re missing are where bacteria can hide. And over time, if you’re not flossing, that trapped bacteria will eat away at your tooth enamel. The best time to floss is before bed, so food doesn’t have 8 hours to fester between your teeth. And ladies, don’t go to bed without taking your mascara off. Sleeping in mascara can cause eye swelling. So, do your face and health a favor and wash up every night.